You can sign up for a plan at any time here, by paying in full or enrolling in a payment plan. When you run out of meals, you can add another 25 meals at any time for $155. A payment plan feature is also available to spread the cost of the plan into four equal payments of $38.75. Simply click on the Add to Cart option below to purchase the plan using MasterCard or Visa. The plan will be available for use the following business day. Meals will not expire during the term of your employment. 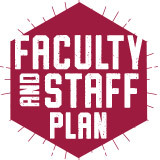 $155.00 Faculty & Staff Plan Add To Cart "Opens a dialog"
$155.00 Faculty & Staff Payment Plan Add To Cart "Opens a dialog"